Propshield Industrial features a special combination of corrosion inhibitors and other chemicals which makes it powerful enough to endure hard labour day in day out in the toughest of climes and in the foulest of waters. 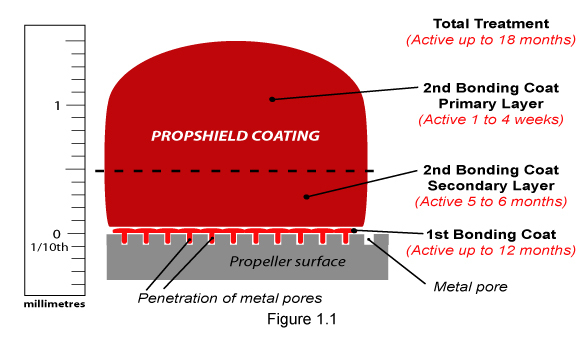 Propshield Industrial bonds to the metal surface of a propeller in a simple 2 coat application process. Once applied it ensures a surface is so slippery that barnacles and hard growth are unable to securely attach to its metal surface, oxidisation and electrolysis are also nullified. Unable to be dissolved in water the Propshield coating slowly degenerates over time leaving a transparent bonded film retained in the very pores of the metal ensuring the product remains active for long periods of up to 18 months. Click here for details on product application. Important: Propshield is no substitute for a good bonding system, the product will work in conjunction with anodes to eradicate electrolysis. Propshield Industrial also helps to eliminate or at least significantly reduce the effects of electrolysis preventing propellers dissolving into the water when shore power is connected. If a propeller is green at the end of the season this is a sure sign that the copper is leaching out of the bronze through galvanic action. This weakens the metal and blades can sometimes break off and penetrate the hull. At best the blade will loose efficiency and your fuel bills will increase as your vessel's top/optimum cruising speed falls. As with all antifouling products Propshield Industrial performs at its best when a vessel is used regularly; the more a vessel is used the more barnacles and hard growth are thrown off from the force created by the rotating propeller and the lack of adhesion caused by the Propshield coating. Propshield Industrial will also perform well even if a vessel is inactive for long periods of time. If a vessel has seen extended inactivity simply take to sea and run at full speed for approximately 60 minutes and most of the barnacles and hard growth that have adhered to the props will be thrown off. A macro cross-section diagram of the product in action/application is shown in Figure 1.1 on the right. As you can see the 1st coat of Propshield bonds to the metal surface penetrating the pores of the metal up to a tenth of a millimetre. The 2nd bonding coat is then applied on top of the first in a much thicker layer. This second coat consists of two sub layers, primary and secondary. The primary and thickest layer plays a critical part in protecting the 1st bonding coat and secondary layer of the 2nd bonding coat ensuring the products overall longevity. This primary layer also has the shortest active lifespan of just 1 to 4 weeks, this may seem a short time however the primary layers job will have been achieved, protection of the secondary sub layer of the 2nd bonding coat and the 1st bonding coat. After the Primary sub layer of the 2nd bonding coat has finished its active life it will fall away to reveal the much harder secondary sub layer of the 2nd bonding coat, this transition from primary to secondary sub layer is known as "shedding". Shedding can occur gradually over a few weeks or all at once depending on various factors such as vessel usage, local sea variables and ambient temperature during application. Regardless of the time span the primary sub layer will only "shed" itself once the secondary sub layer is hard enough to begin its active role in protecting the propeller surface. It is also important to note that any barnacles, hard growth or weed growth that has attached itself to the propeller during the initial 1 to 4 weeks will be ejected from the propeller along with the primary sub layer during shedding. Once the secondary sub layer becomes active it will have achieved its optimum solidity for protecting the 1st bonding coat and the metal of the propeller beneath. During the lifespan of the secondary layer, approximately 5 to 6 months, the surface will become totally transparent resembling the 1st bonding coat during application. It is prudent to point out at this stage that some observers will take this transparency to mean that the product has been washed away and the prop is no longer protected, this couldn't be further from the truth as in fact the product has only reached about a quarter of its active life. The 1st bonding coat becomes active 5 to 7 months after a vessel has been launched and has a lifespan of up to 12 months depending on local fouling conditions and vessel usage. This final layer of protection for the propeller is transparent from start to finish and will act as the final defence against barnacles, hard growth, oxidisation and electrolysis. Once the 1st bonding coat has degenerated and finally left the pores of the metal a vessel can be hauled out/dry docked for Propshield Industrial to be reapplied. If a vessel is not able to be hauled out/dry docked once Propshield has run its active life it is prudent to point out that at this time propellers will be in excellent condition to continue active duty for a lengthy period due to the protection Propshield has provided for up to 18 months previously. For instance if a prop usually needed to be cleaned after 1 year of service then after Propshield had been used a prop would only need to be cleaned after 2 and half years of service.